Didn't these idiots ever see Terminator 2? "In response to this challenge, the Defense Advanced Research Projects Agency (DARPA) is seeking innovative proposals to develop Chemical Robots (ChemBots): soft, flexible, mobile objects that can identify and maneuver through openings smaller than their static structural dimensions; reconstitute size, shape, and functionality after traversal; carry meaningful payloads; and perform tasks." Extra points if you can get it to resemble Robert Patrick. 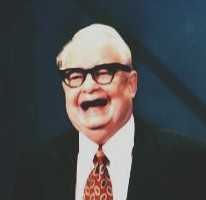 The first person viewers saw when they tuned in to the premiere of NBC's Late Night with David Letterman in 1982 was not Dave, but Calvert DeForest in the role of Larry "Bud" Melman. DeForest appeared as Melman until Letterman moved to CBS, when he used his real name after NBC asserted the Melman character was their intellectual property. See the link on Calvert's name above for his bio. One interesting bit of trivia... Calvert's great uncle was Lee DeForest, the inventor of the three element vacuum tube. This breakthrough enabled the amplification of electronic signals and eventually led to the development of radio and television. The annual Shatner birthday joke, a day early. William Shatner will be 76 tomorrow. His hairpiece will be 49. I mail myself a copy of the Constitution every morning just in the hope they'll open it and see what it says.